Srini works as Senior Development Manager for JDeveloper IDE team and I'm sure hes planning a lot of new stuffs for you in coming days....Stay tuned ! We have seen the basic theory behind the execution of entity and view objects in the first part of this article. In the second part , let us put the theory in to action. Please note this example does not use any API specific to 11.1.2.0 release, so you may be able to reuse the source classes in previous versions also. This example uses two model objects - Department and Employee. The 'Department' is based on DEPARTMENTS table and it follows usual entity and view object generation steps, whereas Employee is based on custom data source and the steps for generating programmatically managed Employee model object is given below. What you may need to know about Target Data Source entry for your tree binding definition? Interesting post on ADF Client Performance Optimization from Matt. While playing around with new featured of 11.1.2.0.0 release, noticed an interesting one on data control side - declarative support for building Transactional Data Control for the business services built using JPAs. It looks cool ! There are a couple of points you may need to be aware of when you try this one. 1. Your should not keep 'Auto Commit' option 'true' for Java Service Facade if you need to defer the transaction commit. If this flag is ON, transaction will get committed as part of each service invocation from client. 2. 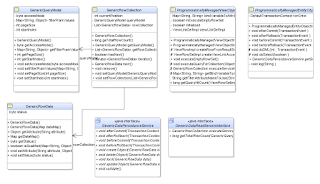 ADF binding layer will never request the EntityManager to manage your entities at run time. So its your responsibility to associate your detached entities with PersistenceContext by calling EntityManager::persist(...) or EntityManager.merge(...) through generated wrapper method from the service facade. The 11.1.2.0.0 release of ADF has added a new configuration entry in adf-config.xml file to globally set the default change event policy for the all iterators in the application. Of course, developers can override the default setting at each binding level. 21.10 Configuring a Page To Render an Unknown Number of Regions in developers fusion developers guide to learn more about this topic. Let me give you a quick overview on the implementation. Its very easy. First step is to build a managed bean to hold your business logic for building list of oracle.adf.controller.binding.TaskFlowBindingAttributes as shown in the following code snippet. If you missed the general public call for papers, don’t worry! You have another opportunity to get included in this year’s event.